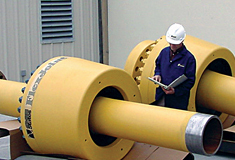 Oil States FlexJoint™ products have been used by the offshore industry in riser, pipeline and mooring systems since 1976 and are an enabling technology for most drilling and production platforms worldwide. Oil States flexible joint technology provided the critical seal in capping the Macondo well in 2010. It withstood over-rotation and extreme well bore temperatures and pressures for an extended duration. This sealing technology is only available with the Oil States FlexJoint™ Assembly. A reliable and cost effective leak-proof connection. A low angular stiffness under high-axial tensions and extreme internal pressures. A means of reducing the bending stresses in the riser and the reaction forces to the subsea stack. Provides omni-directional angular flexing capability. Dampens vibrations and accomodates shock loadings. The diverter Flexible Joint is installed at the top of the riser below the diverter housing where it will encounter significant compression. The Intermediate Flexible Joint is a double-ended version of the subsea flexible joint designed for installation below the telescopic joint. The subsea Flexible Joint is used to couple the riser to the subsea stack.